A Premiere Choice for Youngstown Fans. Sammy, DC and Dallas really are. Also, check out my exclusive interviews with the guys. There's some good stuff in those interviews! It's guaranteed entertainment! It's a chance to show everyone why we, as fans, love our YT men so much! So have fun!! 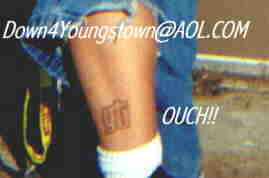 And please sign the Down For Youngstown Guestbook by clicking the Contact Page!! Please Do not take any of the photos on this site without permission of the owner. The interviews are copyrighted by Boogie Down Productions AND Contra Costa Newspaper, so I suggest you don't try taking the interview for your own. Thank You to www.youngstownfan.com for the studio photos.